Each chapter of the web site is broken into three types of resources. Illustrations provide a introduction to the topic through simulations. Explorations are tutorials guiding students through deeper investigations of the topic. Problems are simulation-based homework. Many chapters also include downloadable worksheets to supplement the simulations. W. Christian and M. Belloni, (2013), WWW Document, (https://www.compadre.org/Physlets/). W. Christian and M. Belloni, Physlet Physics - 3rd Edition, (2013), <https://www.compadre.org/Physlets/>. Christian, Wolfgang, and Mario Belloni. 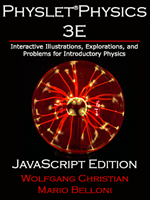 Physlet Physics - 3rd Edition. January 1, 2019. https://www.compadre.org/Physlets/ (accessed 19 April 2019). Christian, Wolfgang, and Mario Belloni. Physlet Physics - 3rd Edition. 2013. 1 Jan. 2019. 19 Apr. 2019 <https://www.compadre.org/Physlets/>. Physlet Physics - Mechanics is Section I of the Physlet Physics collection. Physlet Physics - Waves is Section II of the Physlet Physics collection. Physlet Physics - Waves is Section III of the Physlet Physics collection.